It can sometimes be challenging to explain what it means to be a landscape architect. The profession is incredibly wide-ranging and offers many different areas of specialization. The size alone of a landscape architecture project could range from a few square feet to thousands of acres, and the scope can be just as varied. 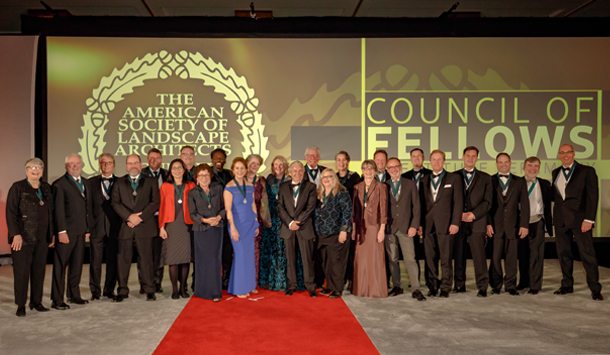 If you’re looking for a quick study in the breadth of landscape architecture, look no further than this year’s class of ASLA Fellows. This group of distinguished landscape architects showcases just how diverse the career path can be. Some of their specializations include pro-bono community design work, protection of landscapes of cultural significance, contribution of research and knowledge of the profession, cross-disciplinary work in water systems and stormwater management, the development of form based code, and the advancement and recognition of landscape architecture throughout the world – just to name a few. We encourage you to check out the 30-minute video that features each of this year’s 23 Fellows Inductees – including RVi CEO Bob Richardson (at the 24 minute mark). This video captures the essence of each one of these diverse careers in a way that is succinct and visually entertaining. Also check out RVi’s Facebook album from the event. Cheers to this year’s Fellows class!